The Brewster F2A Buffalo series of single-engine fighters has long been maligned by aviation writers and historians, although its combat career varied widely because of the meager performance, training levels of its pilots, and the quality of the opposition. In the hands of the Finns, the airplane was highly successful, managing to score against Spitfires, Hurricanes, and other types operated by the Russians. In British and Dutch service, it fared poorly against the nimble Japanese fighters, although the war in Southeast Asia was by no means one-sided. At the Battle of Midway, a few USMC F2A-3's suffered heavy losses against Japanese A6M2 Zero fighters, mainly because of the inexperience of the Americans facing Japanese pilots with much more combat skill. Relegated to a training role after Midway, the Navy's F2A's served well, giving future Navy combat pilots experience in a fighter with modern features. I knew a Marine veteran pilot from WWII, and he said that the airplane was very nice to fly, although he would have certainly preferred a Hellcat or Corsair in combat. The original Navy version, the F2A-1, a design dating back to 1936, was built in small numbers, with only 11 aircraft delivered to the Navy. These served with VF-3 aboard USS Saratoga, the first Navy unit to operate monoplane fighters. As the improved F2A-2 was on the horizon, the Navy decided to release the rest of the F2A-1 order to Finland, delivering 43 under the designation Model 239. The Brewster Company was located in downtown Queens in New York City, a long way from any airport, and this, along with management problems and an overeager sales organization, caused production problems that eventually led to the company's economic decline. In addition, the Navy had determined that the Grumman F4F-3 had more development potential, and although 43 F2A-2's were manufactured, along with 8 F2A-1's which were rebuilt to F2A-2 standard, most subsequent aircraft in the series, designated 339B, were sold to the British and the Dutch. Belgium ordered 40, which were never delivered. A few 239B's were operated by the Royal Navy, but the major production model for the British was the 339E, of which 170 were built as Buffalo Mk. 1. These served mainly in the Far East. The Dutch obtained 24 Model 339C's powered by reconditioned 1,100 hp. Wright R-1820 Cyclone engines bought from American Airlines and TWA, while the following 48 aircraft, designated Model 339D, were powered by new 1200 hp. Wright R-1820-G205 radials. Although overwhelmed by Japanese airpower in Southeast Asia, many British and Dutch Buffalo pilots scored against the Japanese, but in the end nearly all aircraft were either destroyed or captured. The last production model for the Navy, the F2A-3, eventually wound up in the hands of the Marines, and their last use was during the Battle of Midway, where they suffered 60 percent losses. Subsequently, the survivors were used as trainers. The Brewster Buffalo has been issued by a number of kit manufacturers in 1/72 scale over the years, starting with the old Revell version in the 1960's. Airfix issued a much better kit of the F2A-1 in the 1970's, while Matchbox did one in the eighties. A few years later, Hasegawa issued an F2A-1 and F2A-2, differing somewhat in detail, and these have remained the best of the lot. However, no major producer has come out with an F2A-3, so if you want to do some of the late-model Navy and USMC aircraft, you'll have to do some modifications. 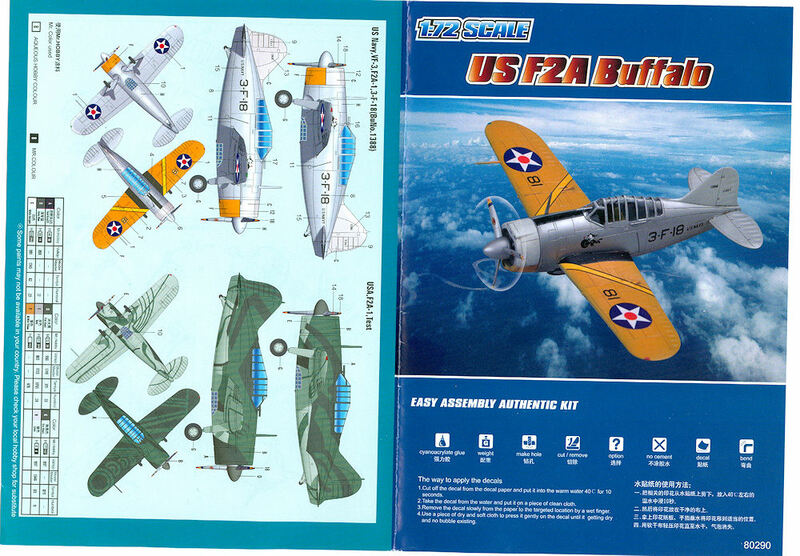 The Hobby Boss offering is yet another F2A-1, and it has some good features although, in my opinion, it is not as good as the Hasegawa kit. Hobby Boss kits are not meant to be highly detailed, and are intended for young, inexperienced modelers. The box top says "Ages 14+" but I think that, with supervision, much younger kids could build one of these kits. They have few parts compared with mainline kits. Consisting of about 20 parts overall, the kit doesn't have much cockpit detail except for a floorboard, seat, and control stick. The shape appears to be accurate, and the recessed panel line detail is very good. Not much filler is needed, and for the youngster, it can easily become a snap-together kit. There is an instrument panel on the decal sheet, but you need to add a small piece of card plastic ahead of the cockpit to mount it on. Noticeably missing is the rollover pylon located behind the pilot's seat, along with the life raft and DF loop antenna which were common for the Navy version. I used one from an Airfix kit, which looks very good, although I neglected to add the rollover pylon which should be made from plastic rod. The engine detail is recessed in the front cowling and is pretty convincing, although a purist would reshape the upper engine intakes somewhat. The wheel wells really need work if you're a masochist, as they are just hollowed-out holes, whereas on the real airplane the opening goes all the way through the fuselage. This could be done, but I didn't bother. The biggest problem is the prop. The one provided in the kit is the cuffed model with the larger spinner, more appropriate for the F2A-2 and F2A-3 versions, and some of the later types had uncuffed props. The F2A-1 did not have this style prop and spinner, so if you want to make this version, you'll need another prop. I used one from an old Airfix FM-2 Wildcat, and it worked perfectly. There isn't much reference material available on the Navy F2A-1, and only a few photos have been published. The kit instructions provide markings for F2A-1, Bn 1388, 3-F-18, and they got the colors basically right except for the chrome yellow cowling undersides, which should be lemon yellow. As for the other decals, a good instrument panel is provided, along with excellent insignias and squadron markings. For the other color scheme, they give information for one of two VF-3 F2A-1's with special experimental camouflage schemes done by McClelland Barclay during 1940. The colors given could be correct, although I have only one published photo of each of the aircraft, and the actual colors are not really known. The planes didn't carry these schemes for long, and since I already had a model of 3-F-18, I decided to do the only F2A-1 that was not converted to F2A-2, Bn 1393, which was operated in the overall neutral grey scheme early in the war. A photo appears in the Squadron's F2A Buffalo In Action, although one of the fuselage markings cannot be determined. Other sources for this aircraft are a late model Profile, and the Osprey edition on Brewster Buffalo Aces. This kit is also easily adapted to the Finnish Model 239, and there are numerous aftermarket decals available for these aircraft, perhaps the most successful of the series. Just be sure to do your homework, as there are some details that require attention. 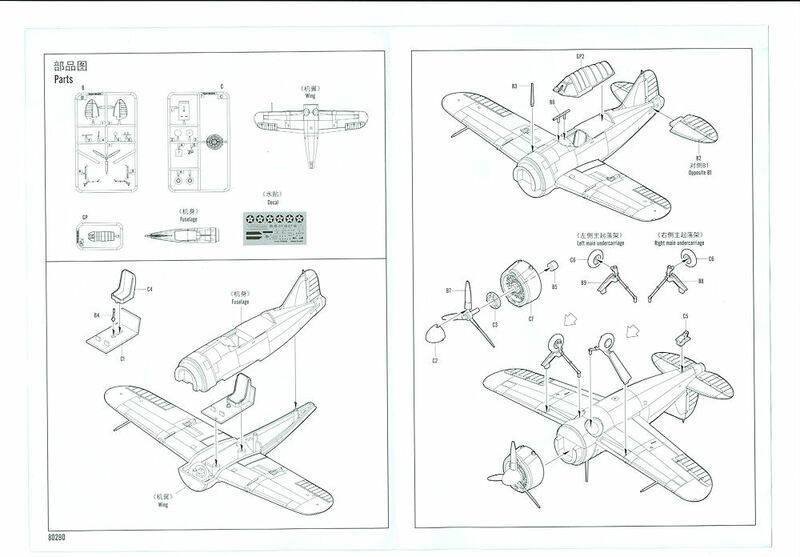 Hasegawa, this is not, but for an easy-build F2A-1 or Model 239, this kit is a good basis for a quick weekend build. These kits are fun. They keep you on your toes, and even for a new modeler, it can be a rewarding experience. Try one of these. Thanks to MMD-Squadron and IPMS/USA for the review kit.